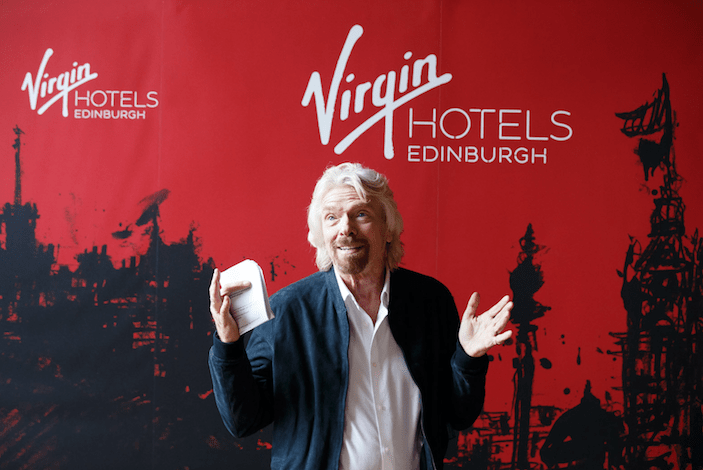 Sir Richard Branson joined a select group in Edinburgh to mark the arrival of his Virgin Hotel in one of its most popular old town locations. The leisure tycoon was joined at the India Buildings in Victoria Street by Virgin Hotels CEO Raul Leal, and Lord Provost of Edinburgh, Frank Ross. Sir Richard announced his plan in February that he intended Edinburgh to be the first location for Virgin Hotel outside the US. Virgin Hotels Edinburgh will offer 225 Chambers and Grand Chamber Suites; multiple dining and drinking outlets, including the brand’s flagship space Commons Club. It also aims to become a major music venue for the city and will create 200 full-time jobs. The hotel is scheduled to open in 2020 and will be completed in partnership with owner Flemyn and developer Jansons Property. It will be managed by Virgin Hotels, and asset managed by Siggis Capital. Its other hotel is in Chicago and work is under way on others in San Francisco, Nashville, Dallas and New York, while there are plans to take the brand to New Orleans, Silicon Valley and Palm Springs. Sir Richard revealed ambitions to expand the brand to Glasgow, where his wife Joan was brought up, if he can find the right site. Guests at last night’s event enjoyed an acoustic performance by city-based singer Nina Nesbitt.